The Pasadena Society of Artists and the Tierra Del Sol Foundation are proud to announce a combined art exhibition at the Lamperouge Gallery during the Brewery open house Artwalk on the weekend of October 22 and 23, 2016. 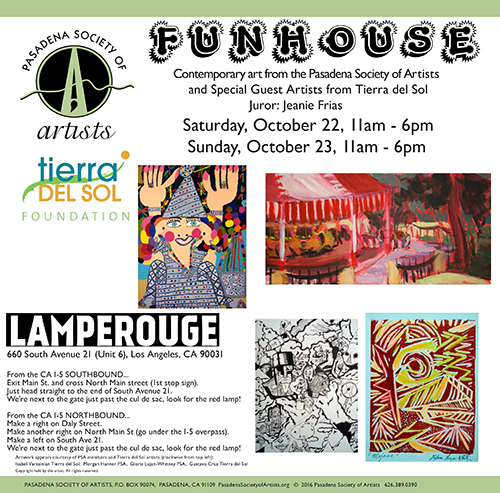 PSA, Tierra Del Sol and Lamperouge present "FUNHOUSE". View 41 new and original pieces of artwork presented by 23 artists as selected by juror, Jeanie Frias. Media presented includes colored pencil on paper , Rapidograph pen and ink on paper, acrylic on canvas, watercolor on paper, oil on canvas, assemblage, etching, stone sculpture, collage, digital photography, woodcut print, mixed media, ceramics, fused glass, and carved wood. All artwork is available for purchase. Meet the artists and discuss their art on both Saturday and Sunday, October 22 & 23, from 11am to 6pm. Lamperouge Gallery is located at 660 South Avenue 21, Los Angeles, just inside the South Avenue 21 entrance of the Brewery Art Colony. Tierra Del Sol Foundation, a not-for-profit organization (established in Sunland in 1971),serves our community by enabling individuals with disabilities to establish meaningful and productive lives and to contribute to the economic, cultural and civic vitality of their communities.  Founded in 1925, the Pasadena Society of Artists is one of the area's original professional artist groups. The Society is noted for its vigorous, active membership, wide diversity of artistic statement, and high professional standards. Membership is by juried submission. PSA is a non-profit organization whose mission is to present the works of its many talented and creative artists to the community of Pasadena and surrounding areas. Combining an active tradition of community participation and partnering with local community arts organizations, as well as philanthropic, humanitarian and educational institutions, PSA endeavors to enhance public awareness of art and the enriching qualities it brings to our lives.